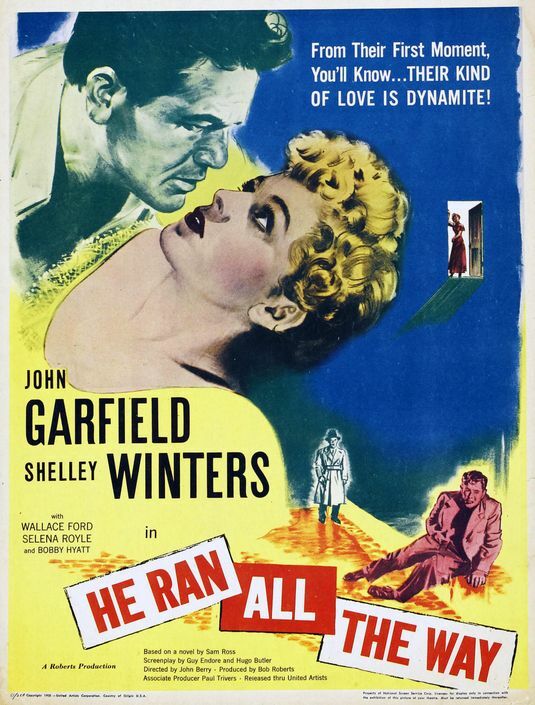 A thief on the lam (John Garfield) seeks refuge with the family of a woman (Shelley Winters) he meets at the pool. While not particularly unique in terms of narrative or characterization, this little thriller nonetheless holds a special place in HUAC-era film history: Garfield — who admitted to membership in the Community Party but refused to “name names” — died of coronory thrombosis at the age of 39, after this film’s release; many believe the stress he was under contributed to his premature death. In addition, notorious blacklisted screenwriter Dalton Trumbo co-wrote the script, which includes some zingy lines of dialogue (“Get the dandruff out of your blood!”) and a fair amount of tension. Perhaps most effective, however, is James Wong Howe’s stunning cinematography: his use of dramatic lighting and depth-of-field add visual interest to the story at all times, even when the narrative falters. Yes, for its significance in film history. A once-must, for the performances (esp. Garfield’s last), JWH’s cinematography and John Berry’s direction. It’s true that there isn’t a whole lot that will be surprising in this film. But it’s solid work all-round and, therefore, worth a watch. Very tense throughout. The conclusion is particularly good. Note: The year before, Berry made a 15-minute film called ‘The Hollywood Ten’, which led him to being blacklisted. The short is on YouTube.